Since vehicle tax discs were abolished in October 2014, it has become less obvious when your vehicles road tax is due for renewal. Therefore, we have written this article, to help anyone check when their vehicles tax and MOT is due for renewal. Failure to renew your vehicles tax can result in an £80 fine and payment of any back taxes that are owed. On the MOT side of things if you get caught driving a vehicle without MOT you could face a £1000 fine or even worse if the vehicle is classed as dangerous you could face a £2500 fine and 3 penalty points on your license. You can check when your vehicles tax & MOT is due by heading over to https://vehicleenquiry.service.gov.uk/ViewVehicle. Or alternatively enter your registration below, and our free check also includes this information. 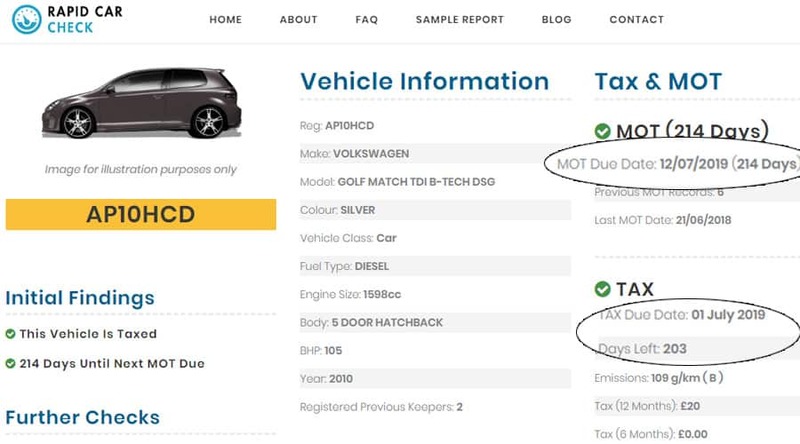 Enter your vehicles registration and you will be taken to the free report page, you will then get Tax and MOT due dates and further vehicle information (screenshot shown below). Simply head over to https://vehicletax.service.gov.uk/ and follow the instructions to renew your vehicles road tax.